Residents of DuPage and Cook County who are 18 or older may register to vote at the Library. 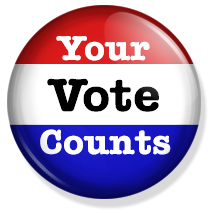 Please note: Voter registration at the Library closes on Tuesday, February 16th for the election on March 15th. Other options for registration and early voting are available. Contact the Circulation Department (630-529-1641, x *222) for more information.